What did Cleopatra look like? After her death, the Roman emperor Octavian ordered all images of her destroyed. Of the countless images created of the queen during her lifetime, only a handful of coins and sculptures remain. Main Liners can walk like an Egyptian with the world premiere of “Cleopatra: The Search for the Last Queen of Egypt” at the Franklin Institute now through January 2, 2011. 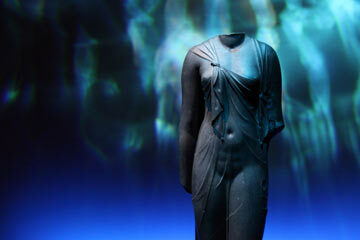 The world of Cleopatra VII, which has been lost to the sea and sand for nearly 2,000 years, surfaced on June 5th when the incredible exhibit opened its doors to the world for the first time. The new exhibition features nearly 150 artifacts from Cleopatra’s time and takes visitors inside the present-day search for the elusive queen, which extends from the sands of Egypt to the depths of the Bay of Aboukir near Alexandria. 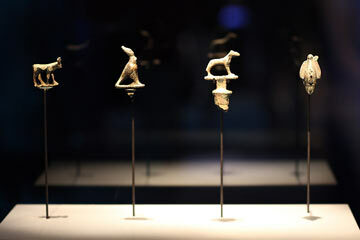 The exhibition is organized by National Geographic and Arts and Exhibitions International, with cooperation from the Egyptian Supreme Council of Antiquities and the European Institute for Underwater Archaeology (IEASM). It features statuary, jewelry, daily items, coins and religious tokens that archaeologists have uncovered from the time surrounding Cleopatra’s rule, all of which are visiting the U.S. for the first time. Naos of the Decades (387-361 B.C.) This naos-the inner shrine that held the temple god-may be the world’s first astrological chart. The year is divided into 36 decades, or 10-day periods. It is the first U.S. tour of artifacts from two ongoing searches into the life and times of Egypt’s legendary Queen. Also on display is an original papyrus document from Cleopatra’s time containing an inscription that scientists believe was written in Cleopatra’s own hand. After Egypt succumbed to Roman forces and Cleopatra famously took her own life following the suicide of her lover Mark Antony, the Romans attempted to wipe her legacy from the pages of history. Cleopatra thus has remained one of history’s greatest enigmas, and her final resting place is one of Egypt’s unsolved mysteries. The story of her life and time unfolds in a dramatic setting with high-definition multimedia, original soundscapes and a mobile-based social media experience. Additionally each guest receives an audio tour with admission that provides a rich background to the featured artifacts. Visitors to the exhibition follow the modern-day parallel stories of two ongoing expeditions being led in Egypt by Dr. Zahi Hawass, Egypt’s pre-eminent archaeologist and secretary general of the Supreme Council of Antiquities, and Franck Goddio, French underwater archaeologist and director of IEASM. Goddio’s search has resulted in one of the most ambitious underwater expeditions ever undertaken, which has uncovered Cleopatra’s royal palace and the two ancient cities of Canopus and Heracleion, which had been lost beneath the sea after a series of earthquakes and tidal waves nearly 2,000 years ago. 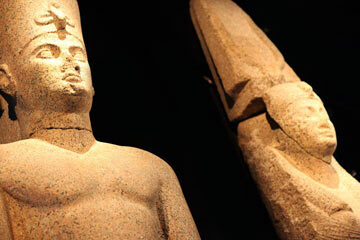 The exhibition opens on the tenth anniversary of Heracleion’s discovery. On land, Hawass and a team of archaeologists are searching for the tomb of the ill-fated lovers Cleopatra and Mark Antony. Never-before-seen artifacts referencing Cleopatra, excavated by Hawass’ team at the temple of Taposiris Magna, about 30 miles west of Alexandria, are featured. The nearly 150 artifacts in the exhibition – from the smallest gold pieces and coins to colossal statues – provide a window into Cleopatra’s story as well as the daily lives of her contemporaries, both powerful and humble. The exhibition contains “social tags” displayed throughout the exhibit, which encourage and guide visitors in sharing their Cleopatra experience on Twitter, Facebook, Foursquare and other social networks through their mobile devices. The tags also feature links to online videos and information, which take patrons deeper into the Cleopatra experience, enabling them to learn and enjoy the exhibition even more. AML goes one on one with Mark Lach, exhibit creative director and Senior V.P. of Arts and Exhibitions of Programs for the Franklin Institute to learn more about the experience of bringing the world premiere of Cleopatra to Philadelphia. AroundMainLine.com: Explain your role with the exhibit. French underwater archaeologist Franck Goddio’s search has uncovered Cleopatra’s royal palace and the two ancient cities of Canopus and Heracleion, which had been lost beneath the sea after a series of earthquakes and tidal waves nearly 2,000 years ago. Mark Lach: It has been a privilege really starting with the King Tut exhibition and now we are revisiting ancient Egypt once again. It is my responsibility to oversee what you are seeing here; certainly the artifacts can stand alone. They are pieces of history, pieces of her world. But, if we can bring some sort of context and some sort of environment, theatrical touch to things, I think it puts people there. During the King Tut exhibition, people would say to me, “I probably will never get to Egypt so today is my trip to Egypt.” So, with that type of responsibility, our team has really brilliantly designed and presented this exhibition to deliver the same experience. AML: What is the most fascinating thing you have learned about Cleopatra during this experience? Mark: I am probably like everyone else, we know her name. We have Hollywood’s view of her—a take on Cleopatra as this beautiful and powerful woman and we have this incredible exhibition. But, most of us know very little. I am just amazed at how strong of a leader she was. We think of her as this sensual, influential and charismatic person that maybe used her beauty but this was a fiercely smart woman with a great deal of drive and passion. 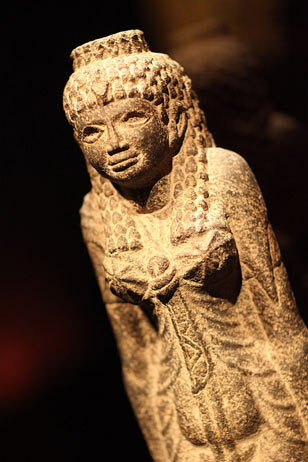 Cleopatra also had a great deal of pride. When she was defeated, she refused to be humiliated and she took her own life. AML: This really presents such a rich, educational exhibit for young and old. 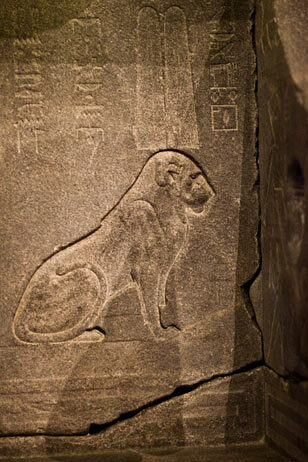 The exhibition contains "social tags" displayed throughout the exhibit, which encourage and guide visitors in sharing their Cleopatra experience on Twitter, Facebook, Foursquare and other social networks through their mobile devices. Mark: When we had our King Tut experience, the little boys who came through (who were grade school children)n would walk out puffing their chests saying, ‘I could be King.’ Now, the little girls can walk away from Cleopatra and think ‘I could have been queen.’ This is really such a powerful story about one of history’s strongest women. AML: How do we know Cleopatra was beautiful? Mark: I don’t think we really do know if she was beautiful. In fact, with some of the images on the coins—if our ideal of beautiful is somewhat the same as what it was at that time-indicate she may not have been classically beautiful—like Nefertiti. One of the exhibits is called “Her Beauty and Power.” What we can deduce is that she was probably quite charismatic, quite seductive and a very sensual and driven person. These two men, Cesar and Marc Anthony, were probably attracted to these qualities. All of these attributes combined made her stand very strong in her seat of power and are why we are here today celebrating Cleopatra. Individual tickets for “Cleopatra: The Search for the Last Queen of Egypt” range from $11 to $29.50, which includes an audio tour. Tickets are timed and dated, and admission is 9:30 a.m. – 5 p.m. Mondays through Wednesdays (last entry at 3:30 p.m.); and 9:30 a.m. – 8:30 p.m. Thursdays through Sundays (last entry at 7 p.m.). There are discounts available for groups of 15 or more and for Franklin Institute Members. Due to high ticket demand, advance ticket purchase is strongly recommended. Information and tickets are available at 1-877-TFI-TIXS, www.fi.edu and www.searchforcleopatra.com. Information about discounted tickets for groups of 15 or more is available at 1-800-285-0684.